At the beginning, the association Quai des Ludes and the Training Center for Games and Toys’ Professionals (FM2J), had the idea to create an ambitious place in gathering actors from the games and toys’ world thanks to their expertise. This desire led to the creation of the Ludopole. The Ludopole association was created in January 2011. 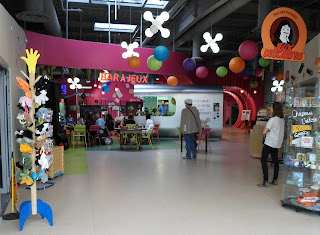 It is made up of the different Ludopole’s entities which are : the Quai des Ludes association, the Training Center for Games and Toys’ Professionals called FM2J, the specialized shops Jeux Descartes and Edulude, and Ludesign which distributes the games to professionals and design spaces. The Ludopole is an information-spot which gathers its own actors wishing to actively participate to the games’ development and its place for every audience without any discrimination. This will evidently respect the individual integrity and all the values declined in the Convention des Droits de l’Enfant (The Child’s Rights Convention). Hard to take kids and teens in museums? The Ludopole organizes in its areas fun and interactive exhibitions, accessible to everyone. These are samples of regional cultural events (Ludexpo).